Not to be confused with Acer saccharinum, the silver maple. Acer saccharum, the sugar maple or rock maple, is a species of maple native to the hardwood forests of eastern Canada, from Nova Scotia west through southern Quebec, central and southern Ontario to southeastern Manitoba around Lake of the Woods, and the northern parts of the Central and Eastern United States, from Minnesota eastward to the highlands of the upper eastern states and the interior Midwest. Sugar maple is best known for its bright fall foliage and for being the primary source of maple syrup. Acer barbatum auct. non Michx. Acer palmifolium var. concolor Schwer. Acer palmifolium f. euconcolor Schwer. Acer palmifolium f. glabratum Schwer. Acer palmifolium f. glaucum (Pax) Schwer. Acer palmifolium var. glaucum Sarg. Acer palmifolium f. integrilobum Schwer. Acer saccharophorum var. subvestitum Vict. & Roll.-Germ. Acer saccharum var. glaucum (Schmidt) Sarg. Acer saccharum is a deciduous tree normally reaching heights of 25–35 m (80–115 ft), and exceptionally up to 45 m (148 ft). A 10-year-old tree is typically about 5 m (16 ft) tall. When healthy, the sugar maple can live for over 400 years. The leaves are deciduous, up to 20 cm (7.9 in) long and equally wide, with five palmate lobes. The basal lobes are relatively small, while the upper lobes are larger and deeply notched. In contrast with the angular notching of the silver maple, however, the notches tend to be rounded at their interior. 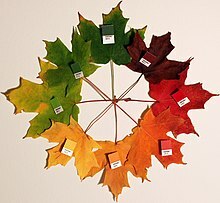 The fall color is often spectacular, ranging from bright yellow on some trees through orange to fluorescent red-orange on others. Sugar maples also have a tendency to color unevenly in fall. In some trees, all colors above can be seen at the same time. They also share a tendency with red maples for certain parts of a mature tree to change color weeks ahead of or behind the remainder of the tree. The leaf buds are pointy and brown-colored. The recent year's growth twigs are green, and turn dark brown. The flowers are in panicles of five to 10 together, yellow-green and without petals; flowering occurs in early spring after 30–55 growing degree days. 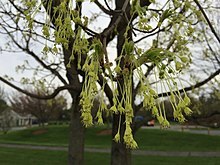 The sugar maple will generally begin flowering when it is between 10 and 15 years old. The fruit is a pair of samaras (winged seeds). The seeds are globose, 7–10 mm (9⁄32–13⁄32 in) in diameter, the wing 2–3 cm (3⁄4–1 1⁄4 in) long. The seeds fall from the tree in autumn, where they must be exposed to 45 days of temperatures below 4 °C (39 °F) to break their coating down. Germination of A. saccharum is slow, not taking place until the following spring when the soil has warmed and all frost danger is past. [need quotation to verify] It is closely related to the black maple, which is sometimes included in this species, but sometimes separated as Acer nigrum. The western American bigtooth maple (Acer grandidentatum) is also treated as a variety or subspecies of sugar maple by some botanists. The sugar maple can be confused with the Norway maple, which is not native to America but is commonly planted in cities and suburbs, and they are not closely related within the genus. The sugar maple is most easily identified by clear sap in the leaf petiole (the Norway maple has white sap), brown, sharp-tipped buds (the Norway maple has blunt, green or reddish-purple buds), and shaggy bark on older trees (the Norway maple bark has small grooves). Also, the leaf lobes of the sugar maple have a more triangular shape, in contrast to the squarish lobes of the Norway maple. 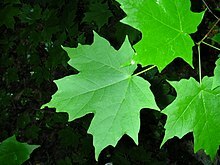 Although many people think a red sugar maple leaf is featured on the flag of Canada, the official maple leaf does not belong to any particular maple species; although it perhaps most closely resembles a sugar maple leaf of all the maple species in Canada, the leaf on the flag was specially designed to be as identifiable as possible on a flag waving in the wind without regard to whether it resembled a particular species' foliage. The sugar maple is an extremely important species to the ecology of many forests in the northern United States and Canada. Pure stands are common, and it is a major component of the northern and Midwestern U.S. hardwood forests. Sugar maple is native to areas with cooler climates. In northern parts of its range, January temperatures average about −18 °C (0 °F) and July temperatures about 16 °C (61 °F); in southern parts, January temperatures average about 10 °C (50 °F) and July temperatures average almost 27 °C (81 °F). Acer saccharum is among the most shade tolerant of large deciduous trees. Its shade tolerance is exceeded only by the striped maple, a smaller tree. Like other maples, its shade tolerance is manifested in its ability to germinate and persist under a closed canopy as an understory plant, and respond with rapid growth to the increased light formed by a gap in the canopy. The sugar maple can grow comfortably in any type of soil except sand. Sugar maples engage in hydraulic lift, drawing water from lower soil layers and exuding that water into upper, drier soil layers. This not only benefits the tree itself, but also many other plants growing around it. Human influences have contributed to the decline of the sugar maple in many regions. Its role as a species of mature forests has led it to be replaced by more opportunistic species in areas where forests are cut over. Climate change has contributed to the decline of the sugar maple by pushing the suitable habitat range for the trees further north, where temperatures are cooler. This has resulted in a gradual northward migration of the species. The sugar maple also exhibits a greater susceptibility to pollution than other species of maple. Acid rain and soil acidification are some of the primary contributing factors to maple decline. Also, the increased use of salt over the last several decades on streets and roads for deicing purposes has decimated the sugar maple's role as a street tree. In some parts of New England, particularly near urbanized areas, the sugar maple is being displaced by the Norway maple. The Norway maple is also highly shade tolerant, but is considerably more tolerant of urban conditions, resulting in the sugar maple's replacement in those areas. In addition, Norway maple produces much larger crops of seeds, allowing it to out-compete native species. The sugar maple is one of the most important Canadian trees, being, with the black maple, the major source of sap for making maple syrup. Other maple species can be used as a sap source for maple syrup, but some have lower sugar contents and/or produce more cloudy syrup than these two. In maple syrup production from Acer saccharum, the sap is extracted from the trees using a tap placed into a hole drilled through the phloem, just inside the bark. The collected sap is then boiled. As the sap boils, the water is evaporated off and the syrup left behind. 40 gallons of maple sap are required to be boiled to produce only 1 gallon of pure syrup. The sapwood can be white, and smaller logs may have a higher proportion of this desirable wood. Bowling alleys and bowling pins are both commonly manufactured from sugar maple. 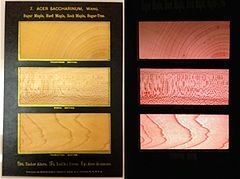 Trees with wavy woodgrain, which can occur in curly, quilted, and "birdseye maple" forms, are especially valued. Maple is also the wood used for basketball courts, including the floors used by the NBA, and it is a popular wood for baseball bats, along with white ash. It is also widely used in the manufacture of musical instruments, such as the members of the violin family (sides and back), guitars (neck), and drum shells. It is also often used in the manufacture of sporting goods. Canadian maple, often referred to as "Canadian hardrock maple", is prized for pool cues, especially the shafts. Some production-line cues will use lower-quality maple wood with cosmetic issues, such as "sugar marks", which are most often light brown discolorations caused by sap in the wood. The best shaft wood has a very consistent grain, with no marks or discoloration. Sugar marks usually do not affect how the cue plays, but are not as high quality as those without it. The wood is also used in gunstocks and flooring for its strength. The sugar maple was a favorite street and park tree during the 19th century because it was easy to propagate and transplant, is fairly fast-growing, and has beautiful fall color. As noted above, however, it proved too delicate to continue in that role after the rise of automobile-induced pollution and was replaced by Norway maple and other hardier species. The shade and the shallow, fibrous roots may interfere with grass growing under the trees. Deep, well-drained loam is the best rooting medium, although sugar maples can grow well on sandy soil which has a good buildup of humus. Light (or loose) clay soils are also well known to support sugar maple growth. Poorly drained areas are unsuitable, and the species is especially short-lived on flood-prone clay flats. Its salt tolerance is low and it is very sensitive to boron. The species is also subject to defoliation when there are dense populations of larvae of Lepidoptera species like the rosy maple moth (Dryocampa rubicunda). The Mohegan use the inner bark as a cough remedy, and the sap as a sweetening agent and to make maple syrup. The national champion for Acer saccharum is located in Charlemont, Massachusetts. In 2007, the year it was submitted, it had a circumference of 5.92 m (233 inches) at 1.3 meters above the ground's surface, and thus a diameter at breast height of about 1.88 m (6.18 ft). At that time the tree was (34.1 m (112 ft) tall with an average crown spread of 27.7 m (91 ft). Using the scoring system of circumference in inches plus height in feet plus 25% of crown spread in feet resulted in a total number of 368 points at the National Register of Big Trees. A tree in Lyme, Connecticut, measured in 2012, had a circumference of 18.25 feet (5.56 m), or an average diameter at breast height of about 5.8 feet (1.77 m). This tree had been 123 ft (37.5 m) tall with a crown spread of 86 ft (26.2 m), counting for a total number of 364 points. 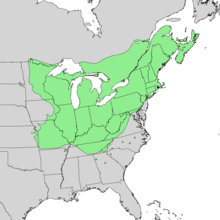 The sugar maple is the state tree of the US states of New York, Vermont, West Virginia, and Wisconsin. It is depicted on the state quarter of Vermont, issued in 2001. ^ "Acer saccharum Marshall — The Plant List". ^ "Acer saccharum". Germplasm Resources Information Network (GRIN). Agricultural Research Service (ARS), United States Department of Agriculture (USDA). ^ "Sugar Maple Tree Facts: Sugar Maple Tree Growing Information". www.gardeningknowhow.com. Retrieved 2017-06-29. ^ a b "Acer saccharum". Northern Ontario Plant Database. ^ "Acer saccharum". Oklahoma Biological Survey. ^ "GSMNP tall trees". Nativetreesociety.org. Retrieved 2011-03-03. ^ Lawrence O. Copeland; M. B. McDonald (31 October 2001). "Principles of seed science and technology". Springer. ISBN 978-0-7923-7322-3. Retrieved 25 September 2010. ^ Godman, Richard M.; Yawney, Harry W.; Tubbs, Carl H. (1990). "Acer saccharum". In Burns, Russell M.; Honkala, Barbara H. Hardwoods. Silvics of North America. Washington, D.C.: United States Forest Service (USFS), United States Department of Agriculture (USDA). 2 – via Southern Research Station (www.srs.fs.fed.us). ^ "Hydraulic lift and its influence on the water content of the rhizosphere: an example from sugar maple, Acer saccharum". Oecologia. 108: 273–278. doi:10.1007/BF00334651. Retrieved 2011-03-03. ^ "Response of northeastern North American forests to climate change: Will soil conditions constrain tree species migration?". www.nrcresearchpress.com. doi:10.1139/a10-013. Retrieved 2019-02-18. ^ "Sugar Maple Faces Extinction Threat". The New York Times. Retrieved 11 April 2018. ^ Siek, Stephanie V. "Sugar Maples Fall Victim to Road Salt". The Boston Globe. Retrieved 11 April 2018. ^ a b Heilingmann, Randall B. "Hobby Maple Syrup Production (F-36-02)". Ohio State University. Archived from the original on 2002-09-17. 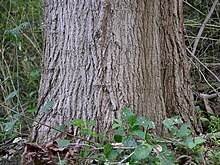 ^ "Sugar Maple: Nebraska Forest Service" (PDF). Nebraska Forest Service. Retrieved February 1, 2019. ^ Daniel L. Cassens. "Hard or sugar maple" (PDF). Purdue University:Purdue Extension. ^ a b "Sugar Maple Plant Guide" (PDF). United States Department of Agriculture. Retrieved 11 April 2018. ^ "Auburn University Entomology and Plant Pathology | Greenstriped Mapleworm". Auburn University Entomology and Plant Pathology. Retrieved 2017-11-14. ^ "Putting Down Roots: Landscape Guidelines for the Selection, Care, and Maintenance of Trees In Central Oklahoma". okPLANTtrees. 3.1.2:Medium Deciduous Trees. Archived from the original on 20 July 2012. Fortunately for Oklahoma, a subspecies (believed to be an ecotype) of the Sugar Maple was discovered in the southwest part of the state that is specifically adapted to our hot summers and drying winds. ^ "Sugar Maple (Acer saccharum) - Champion Tree, National Forests, Massachusetts". americanforests.org. 15 September 2016. ^ "Sugar Maple (Acer saccharum) - Champion Tree, National Forests, Connecticut". americanforests.org. 15 September 2016. Horton, J. L.; Hart, S.C. (1998). "Hydraulic lift: a potentially important ecosystem process". Trends in Ecology and Evolution. 13 (6): 232–235. doi:10.1016/S0169-5347(98)01328-7. PMID 21238277. Canham, C. D. (1989). "Different Responses to Gaps Among Shade-Tolerant Tree Species". Ecology. 70 (3): 548–550. doi:10.2307/1940200. Brisson, J., Bergeron, Y., Bouchard, A., & Leduc, A. (1994). Beech-maple dynamics in an old-growth forest in southern Quebec, Canada. Ecoscience (Sainte-Foy) 1 (1): 40-46. Duchesne, L.; Ouimet, R.; Houle, D. (2002). "Basal Area Growth of Sugar Maple in Relation to Acid Deposition, Stand Health, and Soil Nutrients". Journal of Environmental Quality. 31 (5): 1676–1683. doi:10.2134/jeq2002.1676. PMID 12371186. Melvyn Tyree. "Maple sap exudation: How it happens" (PDF). Maple Syrup Journal. 4 (1): 10–11. Damián Cirelli; Richard Jagels; Melvin T. Tyree (2008). "Toward an improved model of maple sap exudation: the location and role of osmotic barriers in sugar maple, butternut and white birch" (PDF). Tree Physiology. Victoria, Canada: Heron Publishing. 28 (8): 1145–1155. doi:10.1093/treephys/28.8.1145. PMID 18519246. Wikimedia Commons has media related to Acer saccharum. Historic Photos and Technical Reports Documenting Sugar Maple Research, from digital archives at the University of Vermont. ^ "North American Maple Syrup Producers Manual".